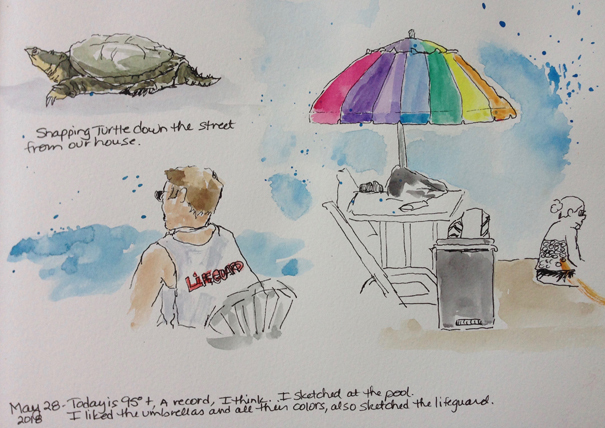 Today I am sharing sketches I did while on activities with my teens. On Memorial day it was frightfully hot, so my daughter and I went to the pool. Under the shade of an umbrella, I sketched another brightly colored umbrella and the life guard. Just that same morning, a huge snapping turtle was hanging out in a neighbor’s yard and started across the street. Looking a bit like a mini dinosaur as it walked, hiked up on all fours, it ambled across, but lowered itself as curious kids pulled up in a wagon to watch it. Most turtles scuttle, with their shell close to the ground. This creature stood a good 4+ inches off the ground! I walked quickly home and got my sketch book and hurried back to sketch it. Eventually it sought shade and crept into someone else’s yard. It was huge! Today I went to lunch with my graduating senior. We went to Cossetta’s in downtown St. Paul. Perched up at a table above the street, we could look out at the traffic and hubbub below. An ambulance screamed by, as well as a noisy motorcycle. I decided to sketch our food while he went off looking for a fork. His sausage sandwich was piled high on red sauce and I had a gorgonzola chopped salad with a red and green pepper. The pepper was a cherry red and when I bit into it, I could feel a little heat, but saw lots of yellow seeds inside. We had a delicious chocolate mousse for dessert, packaged in a pretty white box. I looked over the railing to the building next door, and liked the turrets on top of Patrick McGovern’s pub. So I decided to draw that piece of architecture as well. Tomorrow I begin a 30 x 30 watercolor challenge—-doing 30 sketches in 30 days. This was a perfect day to get a little sketching done and psych myself up for my next drawing challenge, which I’ll post as well.